One of the most exceptional features of the Cox Solutions Store is personalized concierge-style service that begins the moment a customer walks through the door. 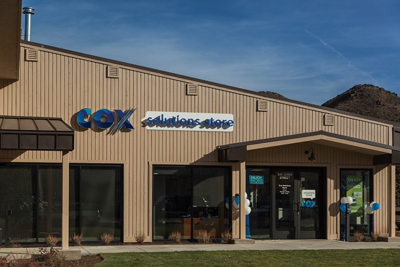 Each person who enters the store is greeted by a friendly Cox employee who takes any equipment they may have, determines their specific question and technical needs, and from there, directs them to the appropriate sales associate or educator for assistance. Also, unique to the Solutions Store is a learning lounge where customers can sign up for a short class to learn how to get the most out of their Cox services or become more comfortable with the basics of installing their high-speed Internet service or set-top box. Customers can learn firsthand how to hook up an X-box, enhance their viewing experience with surround sound, or get their phone and Internet to work together. In addition, Cox’s services are on display for customers to touch and feel while learning about the various features that are important and timely in today’s fast paced and connected global society. In an effort to provide a one-stop shopping experience, Cox also sells accessories at its Solutions Store. When an extra cable, router or any other accessory is needed, it’s available right then and there. You might be surprised to learn one of the most popular items in a Cox Solutions Store isn’t a cable connector or an HD cable, but rather a miniature replica of Cox’s animated mascot. The pint-sized characters, referred to as Digeez have proven to be very popular with people of every age. With enhanced products, accessories, personalized service, and a learning lounge, Cox’s Solutions Store represents the company’s vision of the future of the retail business and overall customer experience. While Cox’s retail location is new, giving back to the Valley is not. Without question, investing in the local community is a strong and ever present Cox value. That’s evident by the large number of Wood River Valley organizations that receive support from this leading telecommunications provider. Cox gives back in countless ways by sponsoring a wide range of community events, and it has done so since it first started serving customers in the Valley. Additionally, Cox supports the Rotary Duck Race, Camp Rainbow Gold, Trailing of the Sheep, Wagon Days, Company of Fools, Girls on the Run, the YMCA, and other worthwhile charitable and civic activities. Cox is committed to the Wood River Valley and with its employees maintaining strong local connections with customers, neighbors and one another. That’s evident through the company’s charitable pursuits in addition to the multitude of product offerings and personalized service available in the Solutions Store.